My awesome man set me up with a little bit of luxury for my kitchen experiments. The first set of sauerkraut in the new fermenting jar tasted awesome. He simply perused the wine making section at the local health food store, picked up the fermenting bubbler you see below and a gasket to go with it, and voila! A neat & clean new fermenter for me! 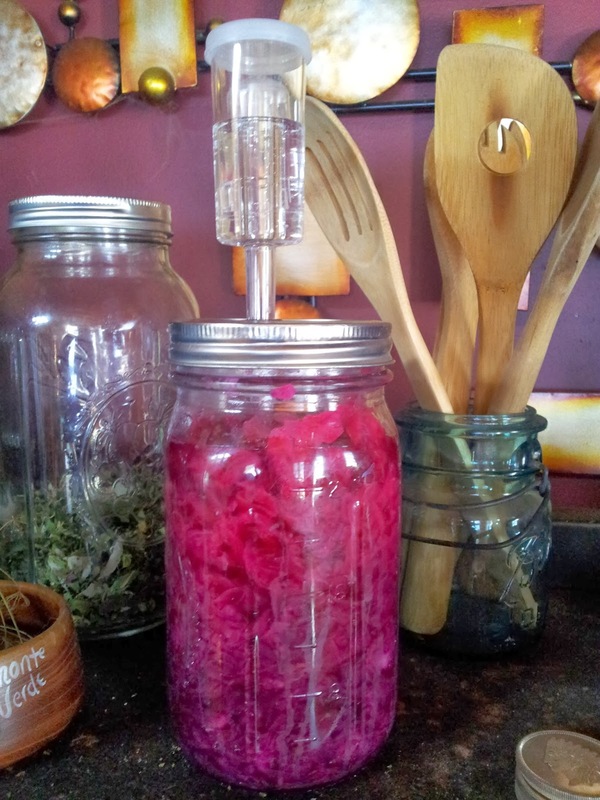 Previously, I was simply using a clean, weighted jar fitted into the top of the mason jar to keep the fermenting cabbage below the surface. I kept the set up wrapped to keep out dust. That worked too. But this is way better ! I am a pretty firm believer in listening to your body's cravings. Sometimes those cravings need to be re-interpreted for our modern minds. We have been a bit brainwashed and our taste buds can get confused. Here is a classic example-- donut craving = sugar craving. Turn back your craving several hundred years and you can see maybe its time for a pick-me-up in the form of some fruit (nature's sugar). Or maybe it is a potato chip craving, which has been the hardest for me to re-train on. This is probably a fat craving. Try an avocado, a handful of roasted nuts, or something with grass-fed butter. I have loaded up on just a ton of butter during this re-training period for my body. I had really missed it I guess! 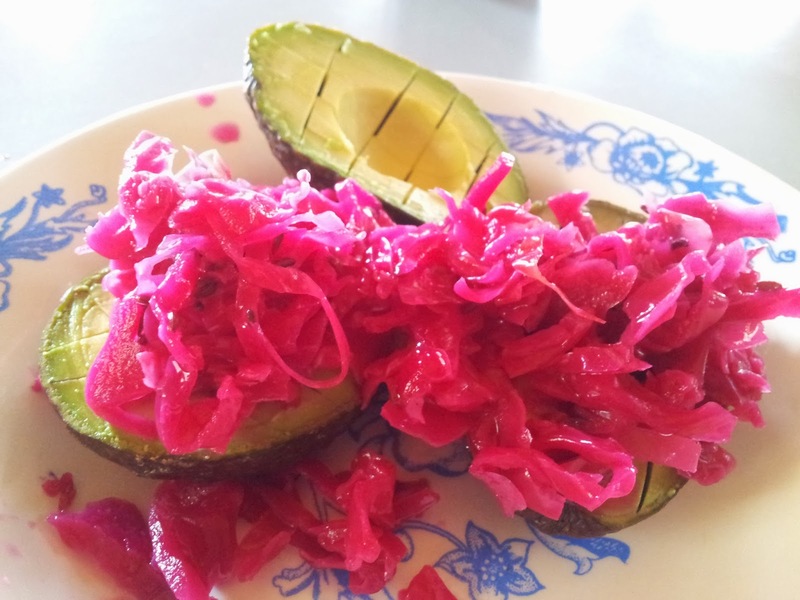 Here is one of my favorite snacks-- Purple Cabbage Sauerkraut stuffed into some perfectly ripened avocado. Yum! My body has mostly needed warming foods, low sugars, and lots of fats lately. I don't typically eat meats and finding non-soy proteins can be challenging. I have had some luck digesting raw cheese. And the chickens have decided its bright enough out to hand over one or two eggs daily. I'll take it! And really, they have deserved their rest. They are good birds. Here is a link to a Sauerkraut tutorial: Easy Sauerkraut I hope you try making some! Its worth it to have the lacto-fermented REAL sauerkraut. If you really don't have the time, then pick up some of the real stuff at the health food store. Its a little pricey, but you will be hooked on its healthy, energizing goodness!